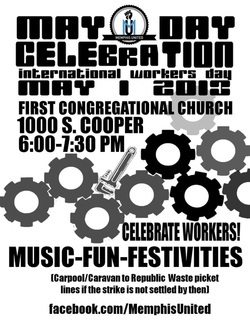 The steps of First Congregational Church will sound a call of action and unity on May 1 at 6 p.m. during the annual international worker’s May Day celebration. Last year, Occupy Memphis and local justice organizations paraded down Union Avenue to the gates of City Hall where they performed political parodies of big business and crooked politicians. This year, a handful of folks from Memphis United – the organization founded in February as a positive response to the Klan rally – pulled together the event in two weeks after becoming inspired by local sanitation workers on strike. Teamster Local 984 sanitation workers at Republic Services went on strike April 16. After two weeks of picketing, the group negotiated a pay raise and 401 (k) retirement plan. “The Teamster’s strike was the big thing going on that served as an impetus for the event. We started thinking, ‘Maybe May Day is a good idea,’” Bob Pearce, core Memphis United member and co-organizer of the event, said. Since then, they’ve been educating themselves on the day’s history and drawing in labor and social justice organizations to be involved. The schedule for the day should move from a few songs related to the labor movement by Barbara Lester into several speakers and end with a call to action and more music. “We’ll have a little music to warm up the crowd first,” Pearce said. Eight speakers are scheduled to talk about what issues their organizations are working on and rally others to join their cause. “The focus is on educating people on what the issues are and connecting them with the organizations that are engaged in addressing those issues and encouraging them to commit to helping those organizations work on those campaigns,” Pearce said. Bennett Foster, the local Socialist Party USA chair, will give a Socialist’s history of International Worker’s Day beginning with its roots in the Chicago Haymarket affair of 1886. Gaby Benitez an organizer for Tennessee Immigrant and Refugee Rights Coalition will speak on behalf of the struggles facing immigrants. Amongst the speakers will be Tennessee Immigrant and Refugee Rights Coalition, Bus Riders Union, United Campus Workers, AFSCME local, Mid-South Peace and Justice Center, H.O.P.E., Worker’s Interfaith Network and Teamster Local 984. Matt Brown will be speaking on behalf of the Teamsters. Originally, attendees were going to carpool to the picket lines following the rally but now are planning to celebrate the Teamster’s gains. Many groups will have tables where attendees can find out more and sign up for whatever interests them.